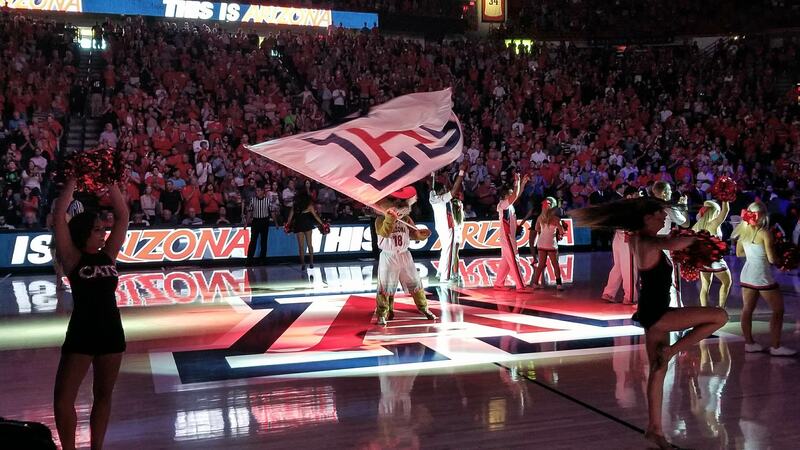 December 5, 2017 / Modified dec 5, 2017 7:40 p.m.
Wilbur the Wildcat waves a UA "Block A" flag before an exhibition match between the University of Arizona men's basketball team and Chico State on Nov 5, 2017. The University of Arizona Athletics Department is one step closer to selling alcohol at basketball games at McKale Center. The Tucson City Council approved the department's request for a liquor license on a 5-1 vote. Council Member Steve Kozachik abstained due to a conflict of interest. He is employed by the department. "Part of it is really responding to the fan experience, where fans have been asking, similar to when they go to professional sporting events or other events in large venues, for the ability to purchase a beer or a wine while they're at that event," said Joel Hauff, who represented Arizona Athletics at Tuesday's council meeting. Council members asked about how selling alcohol would change security and safety measures at and after basketball games. Hauff said that selling alcohol has not caused issues at baseball and hockey games, where sales are permitted since the games are held off campus. "On a national scale, there's a couple of good articles and some research that's being done that shows that generally when alcohol is provided at collegiate events, there is typically no change in the pattern of the number of alcohol-related incidents, or a slight decline," he said. The matter now goes before to the Arizona Department of Liquor for consideration. Unless an extension is filed, the department is expected to rule on the matter by Jan. 25, according to a spokesperson. MORE: Arizona, Pima County, Government, News, Tucson, University of Arizona, U.S.